Food is mostly made up of the four major types of organic molecules (carbs, proteins, lipids and nucleic acids). Some foods tend to be higher in various organic molecules than others. The entire process of digestion is to break down these molecules into their simpler forms because that’s how we would absorb them. Sugars are broken down into monosaccharides. Lipids are broken down into fatty acids. Proteins are broken down into amino acids. Nucleic acids are broken down into nucleotides. With the exception of water and salt, everything we eat comes from a living thing. The burrito you are eating consists of all things that were alive. The lettuce is made up of plant cells. The steak is made of muscle cells. The tortilla is made of plant cells from corn. We often mention the carb, protein and fat content of a food but don’t talk about the nucleic acid content. Remember the nucleic acids are what make up the DNA/RNA that’s found in all cells. So now, just like how we discussed the catabolism (break up) of proteins and fats for energy, we could also mention what happens to old nucleic acids. The nucleotides are broken down into uric acid and this is the second major organic waste product that we excrete in our urine. Remember the first major waste product is urea because the amino acids (from protein) get deaminated (the amine-group breaks off) to become ammonia and ketoacids and the ammonia is broken down into urea and excreted in the urine. What is gout and how does that tie into this topic? 1. Osteoarthritis. This is associated with the inflammation of the joints because of repeated trauma/injury. This is the type of arthritis you see in athletes who have repeatedly injured their shoulder, knee, etc. When you see a doctor for this issue, they would tell you to take it easy. But if a professional athlete is getting paid ungodly sums of money and injures their knee, they cannot take it easy. So they take pain medication and continue using it. When they continue using it, it will get damaged again and if they keep doing this, it eventually leads to osteoarthritis. This is commonly treated with NSAIDs. 2. Rheumatoid arthritis is an autoimmune disease which is probably genetic. We don’t know why it’s more common in women than in men, but it is. In this case the immune system is attacking the joints of the body. This is commonly treated using progesterone. This occurs because the recognition sites are missing which we will discuss a bit later. 3. 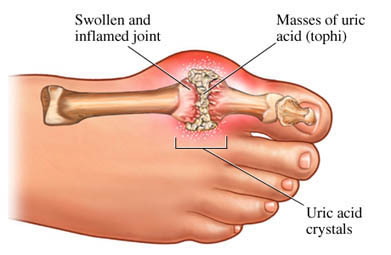 Gout is associated with hyperuricemia. Hyper- means “high” and -emia means “in the blood.” So hyperuricemia means there’s a lot of uric acid in the blood. This is a metabolic disorder (a biochemical disorder) where the body forms very high levels of uric acid and it is probably genetic. Uric acid, a waste product of nucleic acids, accumulates in the sinovial joints of the body and irritates them causing inflammation. For some reason it often builds up in the big toe. The treatment for this is completely different from osteoarthritis or rheumathoid arthritis and the drug often prescribed for this is allopurinol. People with gout are not supposed to eat a lot of red meat. Why? When you eat red meat, you are eating skeletal muscle tissue. Skeletal muscle cells are very different from other cells because they are multinucleated. And what kind of chemicals are in the nucleus? DNA and RNA. So if you’re eating meat, which are muscles, you’re eating something that’s very high in nucleic acids. And what did we say that nucleic acids are eventually broken into? Uric acid! So if you eat a lot of meat, you’re just increasing the amount of uric acid in your body. If someone with gout is going to eat red meat, it’s going to exacerbate the problem. Alcohol also exacerbates the problem, but alcohol exacerbates many problems. Hope that helps give you some ideas of why any of this is even the slightest bit relevant!